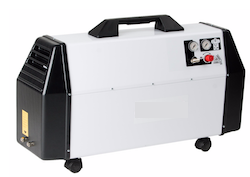 CH Technologies offers a quiet oil-less compressor with after cooler, filters, and self regenerative desiccant air dryer providing -20℉ pressure dew point outlet air and silencing cabinet reducing operating noise level to as low as 57 dB/A. The low noise output of these units mean that they can be installed directly in the work area. These compressors are the ideal choice for clean, dry, oil free, particle free sources of instrument grade air in environments where quiet operation is imperative. Tank Size : 1.57 Gal / 6 Lt.